Andrew Gross is a Professional Jazz Saxophonist and educator. He performs regularly with the Phoenix Symphony and works freelance with many local Jazz and Contemporary Music groups and ensembles. He has played on numerous recordings including three of his own. Andrew has been a featured soloist on GCU Faculty Recitals and the GCU Thunder Big Band, Mesa Community College Big Band. Andrew is a devoted instructor. For the last three years he was the Saxophone instructor at GCU, and taught the Saxophone and Clarinet Woodwind Methods. He also developed and directed the saxophone quartet. This year Andrew will be the Director of the Big Thunder Jazz Band. In addition to his academic role at GCU, Andrew is the Music Director for Young Sounds of Arizona, a youth program, composed of two big bands and a small combo, dedicated to developing not only excellent musicianship but the social skills needed to be successful. His students regularly achieve numerous honors and regularly secure scholarships for college. In addition Andrew is regularly requested as the clinician by high schools in the valley and as instructor of summer camp programs that feature jazz bands. 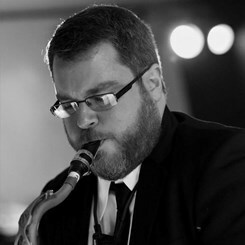 Andrew maintains a large private teaching studio of saxophone and clarinet students in the Phoenix Area. Andrew received a Masters of Music Performance from Arizona State University and a Bachelors of Fine Arts in Jazz and Contemporary Music with honors from the New School University in New York, NY. He studied with a number of well known Jazz Musicians, including Chris Potter, Rufus Reid, Rich Perry, Tony Malaby, Dewey Redman, and Reggie Workman. Request Lessons with Andrew Gross today!